There's a large group of fresh birds sitting over in a KCK shipping lot waiting to be set free. ^About 200. Heavy concentration of morning Nests along Main through Midtown today. They seem to be experimenting with different nesting locations each morning. It made me so happy to see 6 birds within steps of my front door this morning when last week it was about 6 in a 4 block radius. Lime very close to launching. ^Will be interesting to see how broad they start and how many scooters. Ever since Plaza has been red zoned, Bird has no morning Nests south of 43rd now. Grabbed one this morning when I actually needed to be somewhere quicker than I could walk... Nice option to have. They’ve been consistently telling me 500. ^That should cover some gaps. Rode a Bird other day with 30% charge and it didn't have much speed, had to kick a little too often. Lime has bigger batteries but their presence will also mean Birds used less often, so more Birds should have more juice by end of day. Would think most will use whatever is closer or more juice but sounds like in other cities, Lime is preferred if both right there. They may still be checked out, possibly accidentally. Not thrilled with Bird's two step check in. When you click Lock, it should stop the billing. But also could be below 15% power, which is when they take it offline but has enough juice for Charger to find. Probably out of juice or reported damaged. Let's get going lime... And bring those bikes while you are at it. Caught a bird charger putting these out at Up/Down around 9am. We're getting another shipment tomorrow. Checked about 7pm and only two in all of downtown.... Assuming they were all out of juice. Pretty impressive. I'm beginning to wonder what percentage of these things get used legally. I would say for every legal operation I see probably five illegal operations on average. Group of four riding on sidewalk down SWB between Broadway and Main. 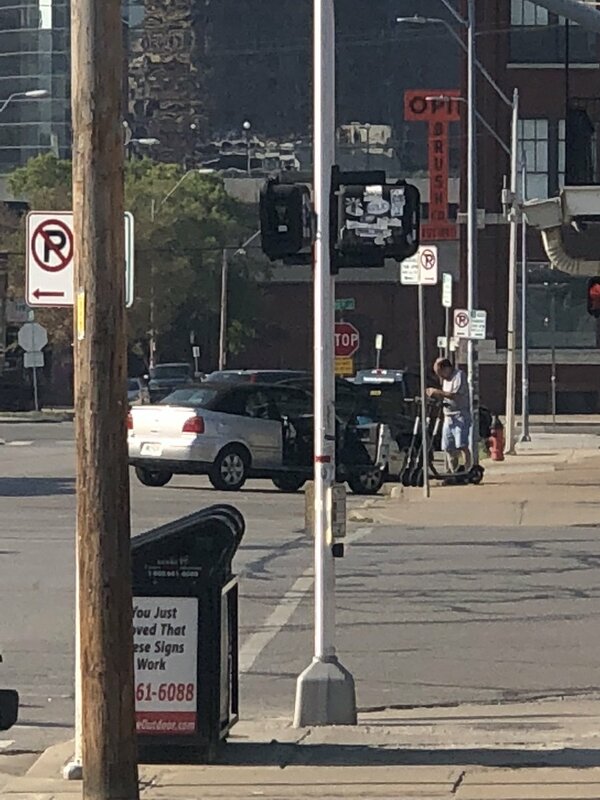 (Saw same 4 riders on scooters on streetcar platform shortly after). Group of three riders on sidewalks at 13th and Main. Group of two riders on sidwalke on Main in Crossroads. Group of two riders weaving between wrong direction and turn lane at 20th and Main. Group of two riders riding up sidewalk on Baltimore. Let's put in more mobility lanes if we are super concerned.... Riders will use them.